A couple of days later, my girlfriend Marj Hoye and I explored Coffin Mountain. After a steep climb, I began photographing a moderate display of flowers just below the summit, while Marj climbed to the top. When she returned, I questioned her about flowers. She said she saw very few. We decided to leave. As we drove home, I was feeling puzzled by the conditions that didn’t seem to match up with my cousin’s experience. So, two days later I returned prepared to spend the night. I worked my way up the mountain in the afternoon heat, taking two photographs and then heading for the top. I chose a different route than Marj had taken earlier. This proved to be the difference. 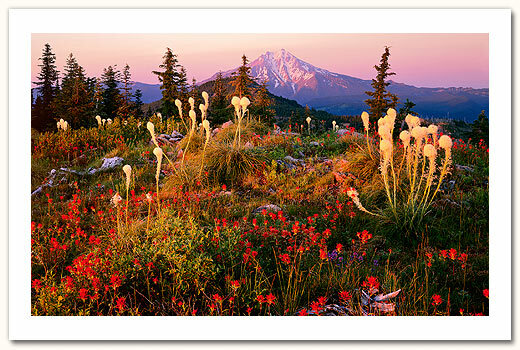 As I approached the ridge top, I was greeted by a stunning stand of Beargrass, Indian Paintbrush and Penstemon. I observed them from various angles and then took several photographs. The ridge line of Coffin Mountain faces west, positioning it perfectly to catch the last warm glow of daylight. I envisioned how it would look just before and after sunset. That’s when I knew I had to find just the right composition to maximize this potential. I walked north along the ridge and eventually came to the elements that would become ‘Twilight Fire.’ I worked the composition until everything felt perfect. The sun slowly dropped in the west. Just when the scene lit up with the warm golden glow of the hour, the sun went behind a thin haze cloud. Would it glow brightly enough when it reappeared in clear blue? Would there be time before it dropped below the horizon? Is 2 minutes enough time? After completing my images, I stopped to admire Mt. Jefferson and the beauty spread before me. Evening twilight turned to dusk as I prepared my bed. Just before I fell asleep, I was startled my the sound of hooves thrashing the ground near me. Evidently deer had drawn close and become startled by my presence. I spent a restless night braced against the cold. The next morning I awoke to a crescent moon hanging over Mt. Jefferson and the very first color of daylight. Rolling over, I fell back into a deep restful sleep, content with my success. The following summer, I returned to Coffin Mountain two days from the date that I had created 'Twilight Fire.' Not only were there no flowers, there was a huge snow bank where the flowers had been! Timing 'is' everything.